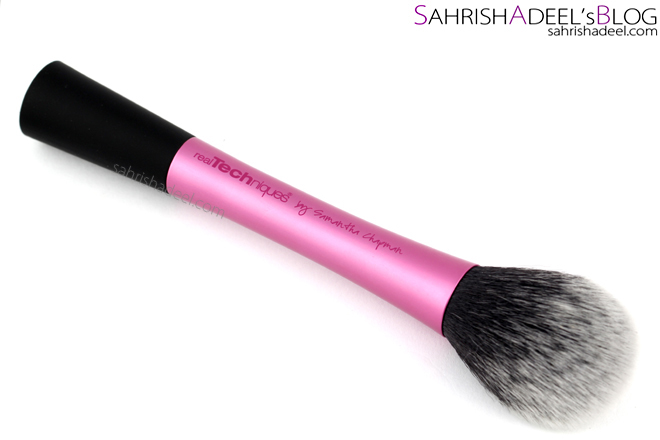 Real Techniques Blush Brush - Review | Sahrish Adeel - Malaysia based Pakistani Beauty & Lifestyle Blogger! 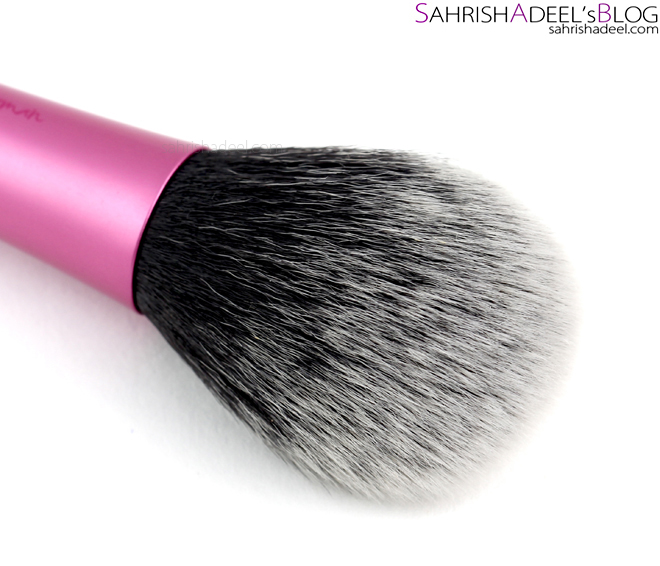 Today I am reviewing Real Techniques' Blush Brush which won my heart for many reasons. Find out more in the post. This blush brush comes in a transparent plastic packaging with complete how to details written at the back along with the photo of gorgeous Sam. I adore these sisters so much! The brush itself has synthetic bristles, the pink colored part is made up of metal and the black grip is made up of rubber material. 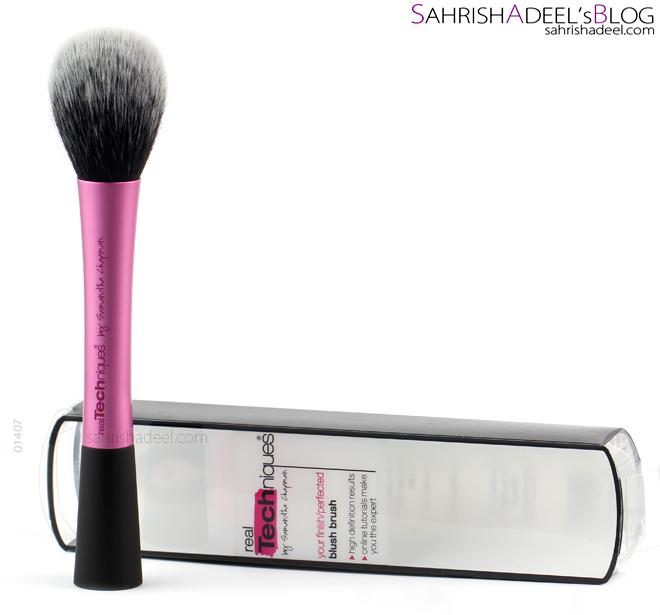 Real Techniques' Blush Brush is one of the highly raved brush in blogosphere and when something is that much hyped, I cannot stop myself from trying it. I must say, I went too crazy and instead of getting one of their brush, I kind of invested my hard earned money on most of their range ( RT haul post here ). Luckily, I was so happy that I traveled these holidays with nothing else but Real Techniques brushes. One of the nicest feature in some of the RT brushes is that they has a flat bottom and they stand on their own which makes it really easy to place and pick from the vanity and they look decorative too. Every brush has a writing on the handle telling you what you can use it for; so thoughtful. Also, this brush has a good weight to it which is a really important factor for me. I don't like too heavy or too feathery weighing brushes. 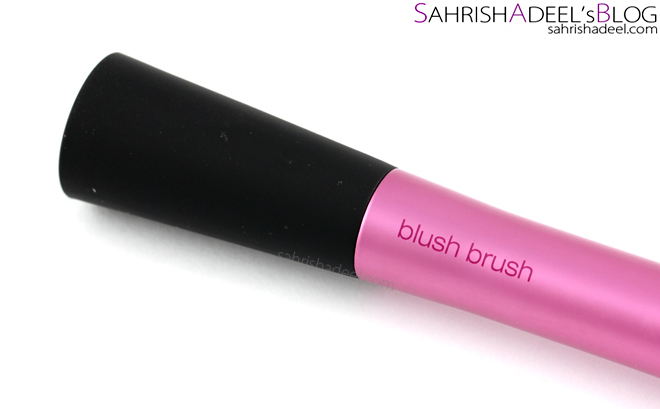 This blush brush is fluffy and really soft but it has more of a dome shape giving you a smaller tip. The bristles are tight on the bottom and spread upwards just like any regular blush brush but for this one, the dome shape won my heart. Sam knew exactly what we all needed and wanted; once again, so thoughtful. I personally pick up the product with the tip, dab it onto the skin and then put a bit of pressure on the brush so it will open up in diameter giving me a nicely blended finish. Washing is easy too and since RT's brushes have synthetic bristles, they don't absorb too much product and do not get stained easily. I wash my brushes with a baby soap and let them air dry for the night. This blush brush takes about six hours to dry since the bristles are not tightly packed. I also did not notice any shedding of bristles so far. Overall, I am absolutely in love with this brush. The design, bristles, shape and that softness is pretty functional and since I got this one, I literally did not touch my Sigma's F30 large powder brush which I use for my blushers. So, you can say that if Sigma is a less expensive dupe for MAC brushes, I can see RT taking the same road but by going even lighter on our pockets.